Route information for addRoutes method. It is preferred to use initializer list to indirectly pass RouteInfo's to addRoutes method. 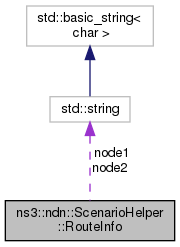 Definition at line 72 of file ndn-scenario-helper.hpp. Definition at line 74 of file ndn-scenario-helper.hpp. Definition at line 75 of file ndn-scenario-helper.hpp. Definition at line 76 of file ndn-scenario-helper.hpp. Definition at line 77 of file ndn-scenario-helper.hpp.